The U.S. Environmental Protection Agency signed a proposed rule exempting livestock farmers from reporting to state and local authorities the routine emissions from their farms. Attending the event were, from left, Tim Stroda, Kansas Pork Association President/CEO; U.S. 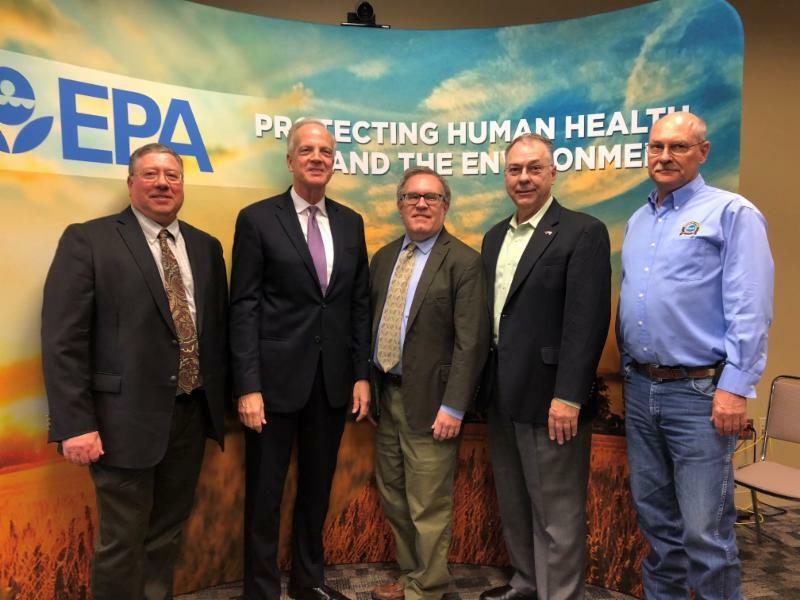 Senator Jerry Moran; Andrew Wheeler, EPA Acting Administrator; Don Nikodim, Missouri Pork Executive Vice President; and Jerry Foster, Missouri pork producer. The National Pork Producers Council applauded the U.S. Environmental Protection Agency for its proposed rule exempting livestock farmers from reporting to state and local authorities the routine emissions from their farms. The Fair Agricultural Reporting Method, or FARM, Act fixed a problem created last April when a U.S. Court of Appeals rejected a 2008 EPA rule that exempted farmers from reporting routine farm emissions under the Comprehensive Environmental Response, Compensation and Liability Act (CERCLA). Commonly known as the “Superfund Law,” CERCLA is used primarily to clean hazardous waste sites but also includes a mandatory federal reporting component. As evidence: The pork industry and other livestock sectors are working closely with state and local emergency response agencies to ensure they receive information about farms that is useful, and last week Smithfield Foods announced new projects to help the company reach its goal of reducing greenhouse gas emissions 25 percent by 2025. The world’s largest pork producer and hog processor is expanding its “Smithfield Renewables” platform – its industry-leading carbon reduction and renewable energy efforts – to help meet that goal. It will implement over the next 10 years, for example, manure-to-energy projects at 90 percent of its hog finishing spaces in North Carolina and Utah and at nearly all finishing spaces in Missouri and convert existing anaerobic lagoons to covered digesters, or construct new covered digesters, to capture biogas.